We can custom build a special basket from our gift stock, combining fruit, chocolates, cookies, dip mixes, and so much more! Call us and let us put together a unique combination for your loved one. 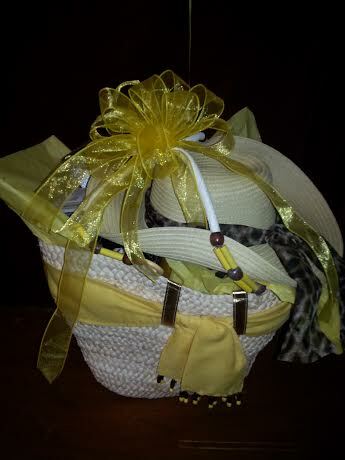 This basket contained Wine, Cheese, Crackers & Cracker Seasonings, Salem Baking Cookies, Cheese Straws, Chocolate Coated Pecans, Napkins, Wind & Willow Dip Mix prepared in a tropical straw tote bag & ladies straw hat and more. Copyright © 2019 Abigail's Gifts, Lenoir NC.